I have Viking ancestors not only on the Holt/Abbot line, but also on the Hubbard line. The Hubbard/Hobart ancestors have been traced all the way back to John Hubba, who was born in England about 1274. According to English genealogists and historians, people with the surname of Hubba, Hubbard, and Hobart are descended from a Viking sea king named Hubba (Ubba), whose father was the Viking warrior Ragnar Lodbrog (Lodbrock). Ragnar's ancestors can be traced all over Scandinavia, through Denmark, Sweden, Norway, and Russia, and through the Visigoths to Roman Emperors. Many of them occupied thrones of one kind or another. In 839, Ethewulf ascended to the throne of Wessex and declared himself to be the King of England. He was the first monarch to make this claim. In reality, he ruled only the provinces of Kent, Essex and Surrey in SE Britain. The first matter to concern Ethewulf was preparations to resist the summer raids of Norsemen who ruled the northern seas and the Scandinavian continent. Scandinavia was the birthplace of savage bands of Vikings who, like the Saxons of old, spent the major portion of their lives on the ocean, pillaging other people. Among the Viking admirals was Ragnar Lodbrog (Regner Lodbrok or Lodbrock), known as Ragnar "The Reafan (Raven)". He was also known as Sigurdsson (the son of Sigurd Ring of Denmark). One of his titles was Danish King at Lethra. He married Aslaug Sigurdottir, which indicates he, too, married his sister. His sons had colorful names. They were: (1) Danish King Siguard II, known as "Snake-in-the Eye"; (2) The King of Dublin (Ireland) Ivar (Hingua), known as "The Boneless"; (3) Halfdan "White Shirt" of the Wide Embrace; and (4) the youngest son, Ubba (Hubba) Rangarsson. Ragnar was one of the most adventurous and successful Vikings. On the shores of the Baltic, in the Orkneys, the Hebrides, Ireland, Scotland, and Northumbria (the area which is now Yorkshire, England), he spread the terror of his name. He was already an old man, when in March 1845, he boldly brought his fleet of 120 ships up the Seine River in France. He caught the French totally off-guard by his early arrival and sailed up-stream to Rouen, where he sacked the town, and then on to Carolivenna (now Chaussy) near St. Germain-en-Laye and about nine miles from St. Denis. The French king, Charles "The Bald" heard of Ragnar's coming and marched at once with a moderate size army against him; but, on approaching the enemy, he made the mistake of dividing his force, sending the two detachments down river on opposite banks. The Vikings fell upon the smaller force and slaughtered it, taking 111 prisoners. Ragnar sacrificed the prisoners to his Nordic gods and hanged them on an island in the Seine in full view of the second Frankish detachment, and then in full fury fell on the now unnerved French troops. Charles, with the remnant of his army, was compelled to take refuge in the abbey of St. Denis and there to watch events. Ragnar, after terrorizing and devastating the area, sailed boldly past the cooped-up Frankish force, and at the end of the month, arrived before the walls of Paris. Paris, was not much more than an island town in the middle of the Seine, but it was beginning to count among the chief cities of the French kingdom, and the prize now offered to the Danes was a rich one. On the approach of Ragnar, most of the population took flight. On Easter Sunday, March 28, 845, Ragnar occupied and plundered Paris. He kept as a souvenir a heavy iron bar from the city gate. His position must have been precarious, for Charles, who was behind him and in a position to block his escape, had been collecting reinforcements and was now at the head of a considerable army. It seemed that all Charles had to do was take up a proper strategic position and Ragnar would be lost. But the necessary courage failed the Christian king, and now came the first of many pitiful and short-sighted French decisions; those follies of cowardly statesmanship that seemed safe expedients. Charles bribed the pirates to depart. Ragnar, therefore, sailed home unmolested, taking with him the plunder of Paris and 7,000 pounds of silver, the price of his promise to leave Charles's kingdom in peace. It was the first recorded payment of protection money to the Vikings, which became such a well known tactic, it was called, "danegeld" which meant Dane's Pay. Ragnar's expedition, didn't get away totally free; a plague visited his fleet on their way back to Denmark. In 850, the Vikings began to over winter on the Island of Thanet in the River Thames. This is the first time we hear of a Viking force using a winter base. Previously, the Vikings conducted summer raids and returned to their homes in the winter. This must have begun a thought process, "The winters are warmer in the south, the seas never freeze, the land is good and there to be taken. Let's stay." Ragnar and his jarls (chieftains) began planning to occupy England. By Ragnar's orders Viking ships of a larger size than had hitherto been sailed by his countrymen were constructed for the invasion of England. Ragnar was growing very old, but refused to retire. (The average person lived to be about 33 years old in those times.) He probably wanted to die a warrior's death to ensure his entrance into Valhalla. Ragnar couldn't even wait for the invasion force to be fully assembled. Perhaps, he sensed that his days were growing short. Prior to 865, he set out with an advance force of just two ships. A storm wrecked his small fleet on the shores of Northumbria. 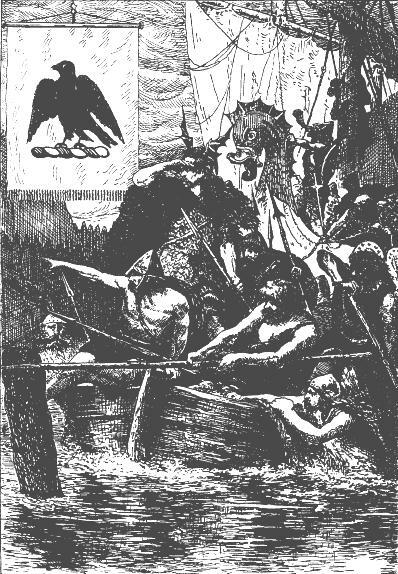 Ragnar with several of his followers made it ashore, and heedless of the consequences, commenced pillaging. Northumbrians had recently cast off the yoke imposed on them by Egbert (a minor king); but, their country was torn by civil dissensions and at that very moment their chieftains were divided by the opposite pretensions of two competitors, Osbert and Ælla (who was not of royal birth). At the news of the Ragnar's pillaging, Ælla flew to the coast and captured him. He was brought to York as a prisoner and Ælla tried to get information about Viking plans from the old man. When Ragnar refused to talk, Ælla had him thrown into a pit of poisonous snakes. As the snakes sunk their fangs into Ragnar, he began to sing his death-song, beginning each stanza with the refrain, "Down we hewed them with our swords..." With his dying breath, he cried, "The piglings would be grunting if they knew the plight of their boar!" When they heard about Ragnar's fate, Hubba and Hingua (in Denmark) and Halfdan (in Ireland) swore to avenge their father's death. Their kin and friends joined in the vow. Eight sea kings and 20 jarls (chieftains), combined their forces for the great invasion. Three of Ragner's daughters wove in one noon-tide (between dawn and dusk), a battle flag that had a raven blazoned on it, representing their dead father. This became Hubba's lucky battle standard, known in Viking lore as the "Raven Banner". The superstitious Vikings watched the bird as they marched to battle. If it appeared to flutter its wings, victory was certain, but if it hung motionless, they anticipated defeat. In the Fall of 866, Hingua (Ivar The Boneless) and Hubba and landed on the coast of East Anglia (Kent). They fortified their camp and waited reinforcements, spending the winter in procuring horses and in gaining the allegiance of some of the Northumberland chieftains. In February 867, they left their camp, marched inland and seized York. The huge families of the invaders started arriving in East Anglia and appropriating property. The Christian clergy in England and France proclaimed that God's prophecy given to Jeremiah was being fulfilled... "Out of the North a scourge shall break forth upon all the inhabitants of the earth." Osbert and Ælla patched up a truce between themselves, united their forces, and first engaged the Vikings outside York. The Northumbrians drove the Vikings back within the city, battered breaches in the walls, and rushed through. The Norsemen fell on the English with great fury and slaughtered them. Osbert was killed and Ælla taken prisoner. In Danish, the punishment they inflicted upon Ælla is called, "at rista örn", the blood eagle. It consists in cutting the ribs from the spine, pulling out the lungs and spreading them like wings on the victim's back, and then pouring salt on them. Thus, they avenged Ragnar's death. This victory gave to Hingua and Hubba undisputed possession of Deira (all the land south of the Tyne and north of Nottingham). The native inhabitants of the area had to purchase the Vikings' friendship. In 869, "the hungry wolves took a bigger bite." Leaving a small force in possession of York, Hubba and Hingua proceeded to attack Mercia. The Norsemen crossed the Humber into Lincolnshire, burnt the rich monastery at Bardenay and put its occupants to the sword. A small army of Saxons in the district of Kestevan stopped their progress for a day, but soon the invaders were sweeping forward to the monastery at Croyland. Oskytue, a Danish chieftain, forced open the gates and beheaded the abbot on the steps of the alter. After burning the monastery, the Vikings marched to Medeshampsted, where the inhabitants resisted them and wounded Hingua. Finally, the gates gave way and the Danes slaughtered all whom they found, including women and children. To avenge his wounded brother, Hubba personally slew the abbot and 84 monks. From the ashes of Medeshampsted, they proceeded to Huntington; destroyed it, and then took the Isle of Ely. The nuns in the monastery, descended from noble Saxon families, were raped by the invaders. Then they seized and fortified the key town of Reading. Edmund, the King of Mercia, was captured at Hoxon-on-the-Waveney (Thetford). He was offered his life if he would forsake Christianity and serve as a vassal under Hingua and Hubba. When Edmund refused, he was bound naked to a tree, and was whipped and otherwise tortured, before arrows were shot into him and his head was cut off. Subsequently, Edmund would be elevated to the status of a martyr and saint in Britain. Further south in Wessex, King Ethelwulf had been succeeded by his oldest surviving son, Æthelred. The new king was assisted by his younger brother Alfred, in preparations to resist the Vikings who were crossing the Thames. In 870 and 871, the Vikings fought many battles against Æthelred's forces. They won all but one. After a terrific fight at Excesdune (Aston) the Danes were routed. Bacseg, a Danish King and five jarls (chieftains) were killed. "A solitary thorn tree pointed out the spot on which the Danes were defeated." The Vikings fled back to their fortified position at Reading to divide their spoils. Halfdan "Of The Wide Embrace" (Hubba's other older brother) and fresh Viking warriors arrived from Ireland and the Baltic. Victorious battles were then fought at Basing and Morton, and King Æthelred was killed. Twenty-three year old Alfred succeeded him. After more battles, Alfred made peace with Halfdan and the Viking army withdrew back across the Thames. They spent the winter of 871-872 in London. Burhred (who had become King of Mercia) paid a heavy tribute to ransom London and the Vikings withdrew back into Deira for a year. In 872, they began to ravage Mercia and by the end of 874 that kingdom was totally in their control. Leicester, Nottingham, Lichfield, and Tamworth had fallen and Burhred abandoned his country to its fate. He fled to Rome where he died. Halfdan set up a Mercian thane as a vassal to rule under him. In 875, the Vikings set about the conquest of Bernicia (to the north) to ensure that they would not be attacked from that direction. They burnt and looted monastery after monastery and before returning to Deira. In 876, Halfdan began the organization of what was clearly intended to be a stable country. He divided the territory under his control up into five boroughs and Danish law and social organization were imposed on the English. This territory became known as Danelaw. Each borough (fortified place) was under a jarl who was responsible for maintaining an army. Wessex (and King Alfred the Great) had been left in peace for five years, but in 876, the Vikings launched another southern invasion. A "western army" probably composed of Vikings from Ireland, landed near Poole Harbor in Dorset. This was joined by another force that a Viking king named Guthrum led overland from Cambridge. Together the two bands plundered the area and seized the town of Wareham and then in 877, moved on Exeter. They were supposed to be reinforced by warriors from 120 ships, but these vessels were destroyed in a great storm near Swanage. Guthrum was forced to surrender to Alfred, who accepted Viking hostages and Guthrum's promise to withdraw back into East Anglia. Guthrum broke his word and his army settled down in Gloucester close to the Wessex frontier. About this same time our ancestor, Hubba was ravaging the coast of South Wales with a fleet of 23 ships and an army of 840 men. In mid-winter, Guthrum suddenly struck with full force against Chippenham where Alfred was in residence. The king was forced to flee. Simultaneously, Hubba crossed to the northern coast of Devonshire and landed his force in the vicinity of Apledore. It appears as if Hubba and Guthrum had agreed to crush King Alfred between their two armies. Alfred was in a very precarious position. Organized resistance broke down and a terrible devastation of Wessex began. So serious was the plight of the West Saxons, that many of them fled across the English Channel. It seemed certain the Wessex would fall. The Saxons in the vicinity of Devon barricaded themselves in a castle on an almost impregnable, scarped knoll at Cynwit. They were led by Odda, their alderman. Hubba was too wary to lose men in a difficult assault. He pitched his camp at the foot of the knoll in the confident expectation that thirst would force the garrison to surrender. Odda must have been a courageous man. During the night, he silently led his Saxons out of the castle and down the hill. At dawn they burst into Hubba's camp, slew him and many of his warriors. Then the Saxons drove the remnant of the routed army to their ships. This became known as the Battle of the Raven flag as Hubba's raven battle flag was captured by the Saxons. Thus perished Hubba and also for a long time the martial fire that burned within the breasts of the adventurous Danes. Hingua afterward invaded Ireland, but he too was killed. Halfdane and Gothrun, their successors, made a very creditable stand against Alfred the Great at Ethandune. Gothrun was captured by King Alfred, but was permitted to live on the condition that he embrace Christianity. With 30 of his followers, Gothrun was baptized at Aulre, and Alfred became Gothrun's god-father. They jointly signed a compact wherein it was declared that, "...the lives of Englishmen and Danes are of equal value." It is not related what became of Halfdane. The descendants of Hubba, Hingua, and Gothrun settled down and helped the Britains protect the land they occupied in Northumbria against subsequent Viking invasions. During Britain's advancement toward supremacy, the Danes became some of England's most skilled and reliable citizens. Hubba left many traces of his remarkable marches. His rapid and extensive movements across England and Wales, and his penchant for camping upon and fortifying high places, has been of great interest to archeologists and historians. There are seven historic eminences that have borne the name of "Hubba's Hill". Rollo Ragnvaldsson's name indicates that he might have been related to our other ancestor Ragnar "The Raven", but I haven't found any connecting link. Rollo's given name was Hrólf. He was born about 870 in Maer, Norway, the son of Earl Rögnvald of More. He was about eight year= old when Hubba was killed in England. Hrólf grew to be such a huge man that no horse could bear his weight. He had to go everywhere on foot and for that reason he became known as Gongu-Hrólf (Hrólf the Walker). History would know him better as Rollo, the founder of the Duchy of Normandy. He took early to a career of piracy in the Baltic. On one expedition he carelessly helped himself to some cattle from Oslo Fjord, in Norway. King Harald Fine-Hair was staying in the area at the time and was so incensed by this impertinent violation of his territory that he had Gongu-Hrolf declared an outlaw. Rollo, sailed off to exile in the Hebrides. From there he took the well-worn Viking trail to join war-bands that were harrying on both sides of the English Channel. He was a member of the "Great Heathen Host" that descended on England between 892 and 896. Some remnants of this mixed army united under Rollo and went to try their luck in France. Like Ragnar, they went up the Seine River. Rouen and several other towns were taken over by the freebooters, and much of the Normandy countryside was overrun by them. In 911, Rollo's army of Danes and Norwegians laid siege to Chartres. His force suffered a defeat and was forced to withdrew. The French king, Charles III (The Simple) suddenly saw the chance of a diplomatic initiative. He summoned Rollo to a parley. They met in the chapel at St. Clair-sur-Epte, which is a little village on a tributary of the Seine. At that time, St. Clair-sur-Epte marked the eastern limits of the Viking occupation of France. At their meeting, King Charles agreed to grant Rollo the lands he already occupied. He was not giving much away. In fact, he was shrewdly using the Vikings as settlers who would defend that part of his realm against future Viking invaders. In return, the Vikings were to swear to him oaths of allegiance as their king and convert to Christianity. It was a classic case of turning poachers into gamekeepers. The cession of towns or lands that were already virtually lost had been going on since the earliest Viking assaults in the previous century. Rollo and his men were ready to settle down. The stained-glass window in an old church at St. Clair-sur-Epte depicts a pious scene, with Rollo on one knee before King Charles. Legend has it that the giant Rollo treated the act of making homage with something less than the respect due majesty. He bent down, grasped the royal foot, and pulled it to his lips. The king fell flat on his back, much to the amusement of Rollo's Vikings. Thus came into existence the Duchy of Normandy (Northmandy, the province of Northmen). By the treaty of St Clair-sur-Epte, King Charles ensured that the garrison of former Vikings would hold Rouen, Lisieux, Evereux and all the lands between the Bresle and the Epte. He also ensured that the pagan invaders would be baptized and become Christian. This stipulation does not seem to have worried Rollo at all. He seems not to have taken his "conversion" seriously. He renounced his paganism as robustly as he had previously practiced it and added one more god to his pantheon of Nordic deities. Probably Charles thought he could wrest Normandy back for himself any time he wished, but in this he underestimated his new subjects. Rollo seems to have realized that the strength of the older Frankish system lay in a different concept of kingship and authority. Whereas, the Vikings had favored a loosely democratic system in which the authority of the king rested upon the freely-given support of his subjects, the Franks imposed authority from above. All land, all law, all loyalty belonged to the ruler. This was the meaning of feudalism, which Rollo grasped and put into effect. For the next century and a half he and his descendants would have a rough ride from rivals within the Duchy and attempted encroachments from without. But Normandy stood firm, and Rollo's dynasty survived. A century and a half later it was strong enough to mount a major foreign invasion, "The Norman Conquest of England". Historical records indicate that most of Rollo's Vikings were men who married French women. The settlers held on to their language for a generation or two, but they were rapidly assimilated into the French culture. Rollo's name was changed to Robert. Robert married Poppa De Valolis and their son, William I "Longsword" succeeded him as Duke of Normandy. William entered into a partnership with Sproata (Adela) of Senlis. William was assassinated, December 17, 943 and was succeeded by his son, Richard I "The Fearless"). Richard entered into a partnership with Gunnora (Gonnor) De Crepon. Their son was Richard II "The Good".